Mark Weivoda played collegiately at Idaho State, where he tied an NCAA record blocking 6 kicks in 2001, and 2nd in history with 8 overall. He joined the Memphis Xplorers (AF2) in 2006, and later in 2007 the Boise Burn. 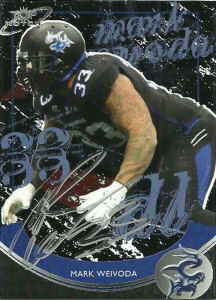 Mark moved to the AFL in 2010, starting for the Chicago Rush, and recorded 22.5 tackles, 8.5 sacks, and 3 forced fumbles. He signed with the Talons in 2012, where he’s anchored the line ever since recording 5 tackles, 5 sacks, and a fumble recovery. I tracked down the heavily tatooed Weivoda after the game, and he couldn’t have been nicer. When I gave him his card he said, “Wow! A card of me? I’ve got a whole box of trading cards sitting at my place. I loved these things as a kid!” Mark gleefully signed his card and thanked me for my time. Weivoda finished his 2014 season with 7 tackles, 3 sacks and 2 fumble recoveries. None of his plays was more important than the fumble recovery that he made in the Talons season finale against the Voodoo. New Orleans was going to kneel the ball to set up the FG on the next down, but Weivoda slipped in and recovered the fumble at the 2 yard line. Initially he rumbled and stumbled all the way back for a TD, but it was called back. Still, his play allowed the Talons to force overtime, and from there they beat the Voodoo 38-35. It was one of the most exciting games that I have ever witnessed. With the suspension of the San Antonio Talons franchise in 2014, the much traveled Weivoda was assigned to the Las Vegas Outlaws expansion franchise for the 2015 season.